I have entered my work into the Flair Awards every year, starting from my first year at Metropolitan South Institute of Tafe. Though I have never won anything before, it was always great to have my garments in the finals each year. Last Saturday night, 28/Aug, after a 9 hour drive from Brisbane with my teachers Chris and Linda and my sister Poya, we arrived at the Flair Awards in Taree, NSW. We came all the way from Brisbane to get a taste of the excitement and to suss out the excellent works on show. Little did I know, I got more than I could ever have hoped for! The show started, the music played, and when my garments came out of the runway, my adrenaline was pumping! The garments looked beautiful on the models… just like how I imagined they would be. The major categories of the Flair Awards include Avant-Garde, Generation Y, Racewear, Millinery, Cocktail, Swimwear, Tailoring, After Dark, and Bridal. There were some amazing works from various TAFE and universities, as well as professional designs. You could really get a sense that there is so much amazing talents in this vibrant industry. Then they announced my name, “and the winner is…Anna Peng!” Not once, not twice, but three times… It’s like winning a huge lottery. The only difference was knowing the hard work I’ve put in made the moment so great! I won in total 3 awards- “Collections”, “Cocktail”, and the big one- “Designer of the Year”. Winning the 3 awards felt so surreal. My heart pounded as I stepped on the stage, the bright lights shone in my eyes, the silvers sparkled behind me. I could feel the excitement from my teachers, my sister, my friends, the crowds cheering, all the faces smiling back at me, my whole world stood still. I felt so much honour and appreciation in my heart. Holding the mic, my voice was shaking with excitement. I didn’t care if I said anything silly on stage, which I probably did. Oh never mind! I hurried off the stage and Pam Petherbridge asked me to come back and walked with my models on the stage. I remembered watching fashion shows where the designer comes out with the models in the end on the catwalk. I’ve always wished that one day I get to do that. And now look at me! The feeling was INCREDIBLE! Just in case I missed thanking anyone…I’d like to thank The Flair Awards for making the magic happen; my MSIT TAFE teachers – inspirational and dedicated people who always inspired and supported me unconditionally (special mentions to my mentors couturier Kerry Xynias and Chris Twine); The fabulous judges who could appreciate the art in my works; my friends – the numerous last minute hand sewers who came to help out; my family who also became my last minute sewing slaves, who have always been there for me 24-7 and fed me when I lacked food; my partner who picks up pins and fabric scraps after me and put up with my messiness everyday; my fellow fashionites who helped little bits or big bits along the way; the people who appreciate my work.. THANKYOU ALL! Photo credit Manning River Times. Holding the two trophies, I’m now officially The Flair Awards “Designer of the Year 2011″ , who would have known that only 4 years ago when I didn’t know how to thread a machine?! News article from Manning River Times about the event. This entry was posted in Uncategorized and tagged Awards, Collection, couture, gown. Bookmark the permalink. Hi Anna, my daughter Persia Hegarty( blonde hair) was one of the models (she wore the dusty pink dress with the detailed yolk) those 3 garments were absolutely stunning and your wins were so well deserved. We are all so happy for you and wish you success in your career as you are so talented, keep up the great work for the fashion industry. 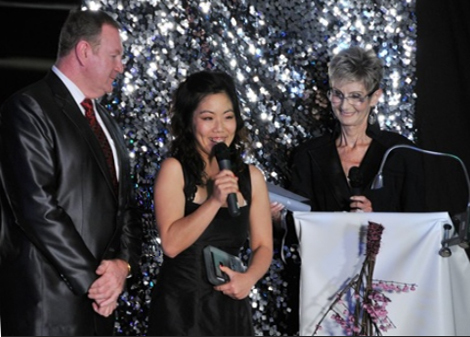 Flair Fashion Awards are a real buzz for Taree.